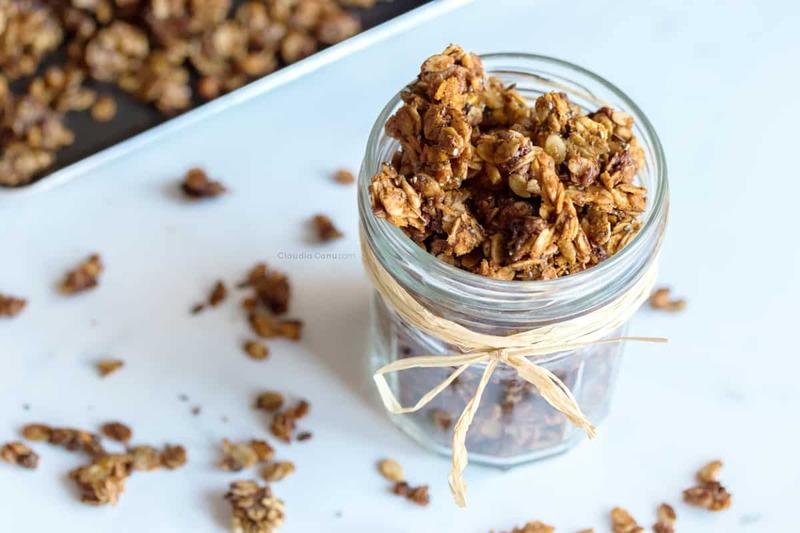 This almond butter granola is a very simple recipe to prepare, ideal for a sweet breakfast, perfect for a snack and easy to add it to your Healthy Meal Planning. You can mix and match ingredients and find the flavors which most adapt to your palate. You’ll also find instructions to make a vegan or gluten-free version as well. As you can see from the video below, this almond butter granola is very easy to prepare because you simply have to mix all the ingredients in a bowl and then lay them out on a tray. It’s important that the tray be non-stick. I personally fell in love with the one I bought on Claudia & Julia’s online shop. If you don’t have a non-stick tray, you can also use parchment paper to avoid sticking. I don’t have a fan in my oven, so in order to achieve an even baking, I rotate the tray mid-cooking. If you also lack a fan, I recommend you also employ this little trick so your granola will bake evenly. 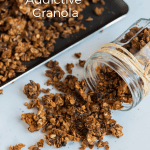 Personally, I love it when my granola is crunchy and I’ve discovered that the best way to achieve that perfect crunch is a drastic change in temperature. When I prepare it during winter, I usually put the hot tray on top of the table on my outdoor terrace for 10 minutes. If you don’t have a terrace or if you prepare it during summer, you can let it sit in the freezer for a little bit, although I’m usually not a fan of putting hot things in the freezer or fridge. So, if you’re like me, you’ll have enough patience to wait and let the granola cool down on its own. 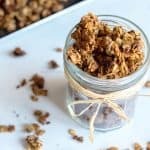 Is it cheap to prepare this almond butter granola? This depends on the set prices of the required ingredients in your country. 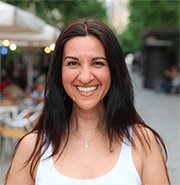 In Spain, it also really depends on whether you are buying organic ingredients or not. In Barcelona, for example, I have yet to find a non-organic almond butter which is made solely of almonds, without any added ingredients. One jar of pure organic almond butter is not cheap, but I personally prefer to invest a bit more in a product which I know will be made up of ingredients which are good for me. If you tend to buy online, this would be a great option since it’s all natural and the only ingredients are almonds. In terms of honey, if you normally purchase a raw and organic one, you’ll know it’s also not cheap. This Certified Organic Raw Honey looks like a great option. If you don’t usually have seeds and dried fruits at home, it has become easier and easier to make your purchases of these products by bulk in Barcelona, which is ideal if you want to buy these ingredients just for this recipe, since you can control the amount you’d like to take home. Although I highly recommend having some of these around the house so you can snack on a small quantity every day since they are all rich in healthy fats, vitamins, and minerals. 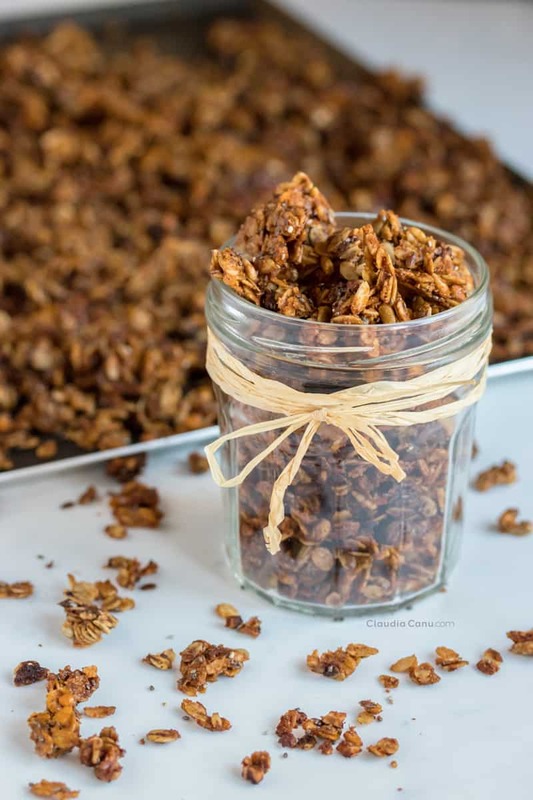 I love to prepare this almond butter granola during winter, especially on the coldest days when I crave something warm for breakfast and when it is incredibly pleasant to feel the heat emanating from the oven. Also, the trick I mentioned above about the drastic change in temperature to create a crunchy texture is easier to achieve when it’s cold since all you have to do is leave the tray outside for 10 minutes. Finally, this granola stays crispy even if you pour it into warm milk, just as long as you don’t leave it soaking for too long. So, during winter I love to warm up some milk and add in a few tablespoons of granola with almond butter. What is the best way to store it? A glass jar is the most ideal. I have many recycled glass jars in my kitchen and I usually use one of those. It’s best to use one that seals well to avoid any excess air. I can’t really tell you what date it’s best to be consumed by because I usually eat the entire jar within a week and it maintains the same perfect and delicious crunchy texture as the day I prepared it. If you usually eat breakfast or lunch out, this granola is easy to bring around with you, for example, if you wanted to take some to work. The best is to store it in a small glass jar so it’s not so heavy to carry around and all you have to do is add it directly to your milk or yogurt. 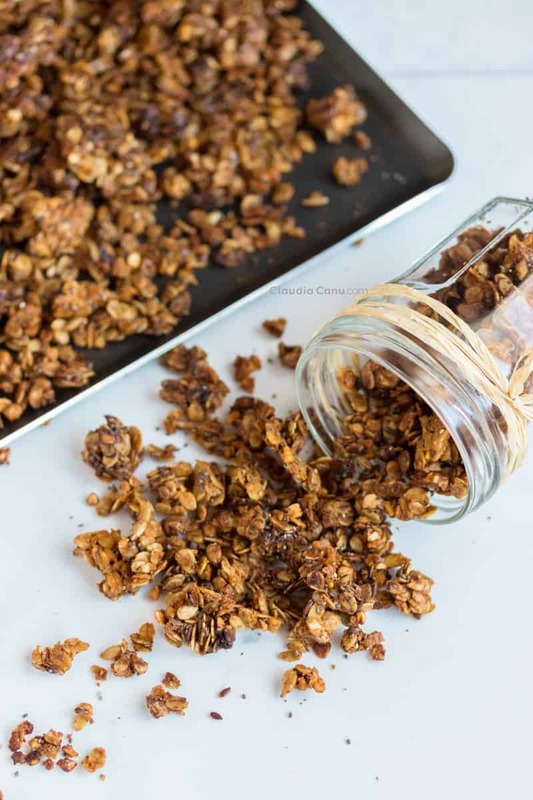 To make a fully vegan version of this almond butter granola you just have to substitute the honey with your favorite sweetener. It can be maple syrup or agave syrup. To convert this recipe into a gluten-free almond butter granola you just have to use gluten-free oat. You’ll love this almond butter granola so much that you’ll want to snack on it all day. It has definitely happened to me before! It’s best to consume it for breakfast so that the carbohydrates found in the oats can provide you with energy throughout the whole morning. As I’ve already shared, I love to eat it during winter with warm milk, but it also tastes incredible when added to cold milk or yogurt. It’s also great for a snack, and I sometimes munch on it as if I were eating popcorn. When I prepare it, I leave it in the glass jar which usually ends up next to me as I am working, so I just continue to munch on the clusters on their own, without needing to add any milk or yogurt. This is also why I don’t prepare this too often— I just become too addicted! Can I prepare it using other ingredients? Of course, you can. You can use peanut butter instead of almond butter if you like. You can also select any type of seeds and dried fruits of your preference. It’s actually better to switch ingredients around each time since this recipe can be prepared in so many ways and achieve so many different flavors. I even dare to say that it’s similar to pasta in that sense, you just can’t get bored of eating it because you can prepare it in an infinite amount of ways. Does it have a lot of calories? Eating granola is definitely not equivalent to eating an apple. The carbohydrates in the oats are absorbed slowly and do not make your glycemic levels peak, but do keep in mind that we are adding some sugars (maple or honey) and you also have to consider the fats in the seeds and the dried fruits. You definitely have nothing to worry about if you are consuming 4 tablespoons a day, but you also have to be mindful to not consume half a kilo in one sitting! Remember that, in general, it is also important to vary your diet, including your breakfast. Let me know if you decide to prepare this recipe and do share your thoughts on how you enjoyed it. Did you eat it for breakfast or as a snack? With milk, yogurt, or just on its own? 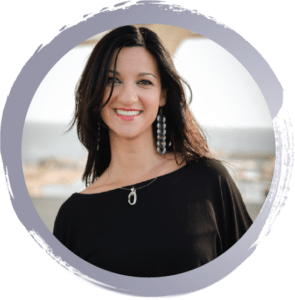 As always, don’t hesitate to get in touch with me by leaving a comment below or by sending me an e-mail directly at hola@claudiacanu.com. Take a medium-large bowl and mix in ¼ cup of melted coconut oil, ⅓ cup of honey, and ⅓ cup of almond butter. Incorporate together until all ingredients are completely mixed. Add 2 teaspoons of cinnamon, ½ teaspoon of vanilla powder and ⅛ teaspoon of salt. Mix in well. Add all remaining ingredients: ¼ cup of sunflower seeds, 2 tablespoons of flax seeds, 2 tablespoons of chia seeds, ¼ cup of chopped raw almonds and 2 cups (220 gr) of oats. Mix until completely combined. If you are using a non-stick pan, pour all contents from the bowl onto the tray and distribute equally to create a single uniform layer on the tray. Bake for 20 minutes total. I recommend taking the tray out 10 minutes in and turning the tray so that it bakes evenly on all sides. If you notice that the top starts getting a little burnt, turn off the top oven and just let the bottom oven on. 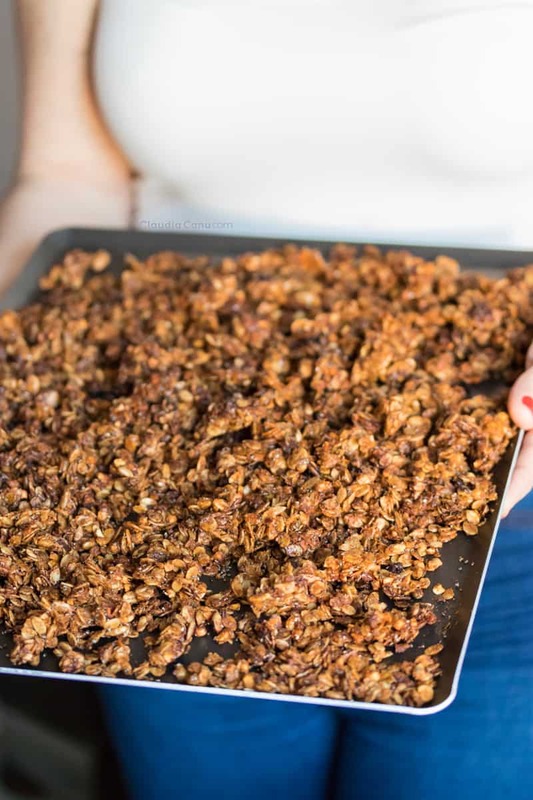 Take out the tray and expose it to low temperatures for 10 minutes (in the text you’ll find further instructions about this step) so that the granola gets a crunchy texture. I’ve never tried a granola using nuts butter. I’ll give this one a goal because it really looks delicious. Thank you for the video, it does make very easy to see all the steps needed. I love almond butter in granola!! I adore the taste and feel it makes everything taste better! 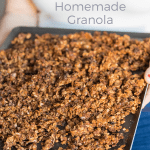 I love crunchy granola too and your recipe looks so delicious! Thank you so much, Elaine! I agree with you, almond butter makes everything taste better! 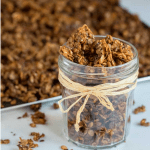 Homemade granola is one of my favorite treats to enjoy in the morning, and I love this healthy recipe! This looks so good! It’s the perfect way to start the day. So nutritious and delicious!